The school was attended by 47 students and 14 lecturers, from 20 different countries. For the first time the school was able to support a number of full bursaries, that covered the registration fee as well as the meals and lodging for the duration of the school. The bursaries were granted on a first come first serve basis to students having a reference letter from their professors. That has allowed the participation to the school of a number of very young researchers, who hopefully will contribute in the future to the much needed advancements of the research in the field of preservation. The interest shown for the school, also on the part of those that in the end were not able to aprticipate, and the enthusiasm of those that actually participated were such that it really seems that the school is satisfying a need in the preservation arena. It is already planned to have a fifth edition of the school in 2009, on June 7-13. Most probably the venue will be the same, as Hotel Continental in Tirrenia, near Pisa, has proven an excellent location, combining the facilities of a modern conference center with the amenities of a beach resort (taken advantage of by the participants during the lunch break). 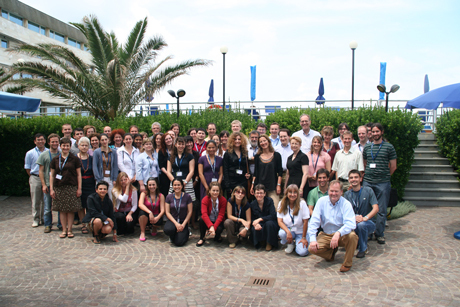 Participants of the Delos Summer School 2008.